The revised agreement is backed by District Mayor Muriel Bowser. The $6.8 billion Exelon-Pepco merger inched closer to approval today, with D.C. regulators agreeing to extend consideration of the deal. Exelon filed a motion to reopen the acquisition proceeding yesterday, after reaching a revised agreement backed by D.C. Mayor Muriel E. Bowser. The Washington, D.C. Public Service Commission announced Wednesday afternoon that it will accept comments on the motion through October 16. Regulators could have voted to not consider the filing. D.C. regulators unanimously rejected the initial deal in August after it had already been approved by the Federal Energy Regulatory Commission and state regulators in Virginia, Maryland, New Jersey and Delaware. The decision dealt a blow to one of the biggest utility merger deals in the country. Commissioners determined in a broad ruling that Exelon’s bid was not in the best interest of Pepco’s D.C. customers. Exelon’s “primary interest is not in distribution, but in generation,” the decision read. Reports that Mayor Bowser had reached a settlement with Exelon have been circulating since last Friday. The mayor’s office confirmed on Tuesday that Bowser had negotiated a new deal, reversing her previous decision to oppose the merger. Under the settlement, Exelon will invest $78 million in the District, five times more than the originally proposed investment of $14 million, according to Bowser’s office. A large chunk of the funding, $55 million, is dedicated to keeping electricity prices affordable for D.C. residents. That includes $25.6 million to protect residential ratepayers from rate increases through March 2019, nearly $16 million to aid low-income ratepayers, and a $14 million one-time residential bill credit worth an average of $50 per ratepayer. The D.C. credit is lower than the rate credits secured in Delaware ($128), New Jersey ($114) and Maryland ($100). Exelon has also agreed to a $17 million sustainability fund. This includes $3.5 million to support energy-efficiency projects, $3.5 million to support solar development, and $10 million to the D.C. green building fund. In addition, Exelon has agreed to develop 10 megawatts of solar and to purchase 100 megawatts of wind within five years of the merger closing. 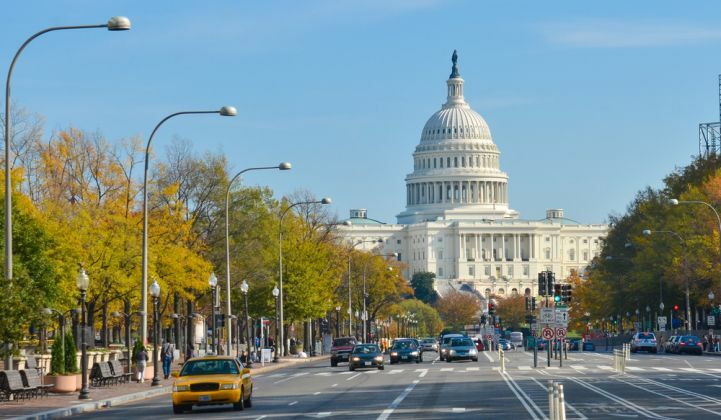 The agreement would also enhance grid reliability through the development of four microgrids and an improved interconnection process for distributed generation customers, Bowser’s office said. Exelon will move 100 existing positions to D.C. and invest $5.2 million in a new District workforce training program. Rob Rains of the policy research firm Washington Analysis said he has grown increasingly confident that the merger will be approved. If the PSC decides to reopen the docket, the deal could pass before the end of the year. But if the PSC ultimately decides to open a separate docket, which Rains said is likely, a decision could be delayed into 2016. The merger deal values Pepco at $27.25 per share, up 36 percent from the company’s $20 stock price prior to the merger announcement. Pepco stock sat around $26.50 on Wednesday afternoon, an indication that the market believes the deal will pass. But several D.C. environmental and neighborhood groups are steadfast in their opposition. Anya Schoolman, president of DC Solar United Neighborhoods, said the solar provisions do nothing to enhance the D.C. solar market. Schoolman said it’s hard to see how she could ever support the merger based on Exelon’s track record of opposing net metering and community solar in other states. Exelon has never sat down with the local renewables industry to understand their needs, even after the deal was rejected, she said. Exelon launched a major lobbying campaign in D.C. after the deal was voted down. The utility recruited former mayor Anthony Williams, mentor to Mayor Bowser, to help negotiate a path forward. Filings related to the merger application (FC 1119) are available here.